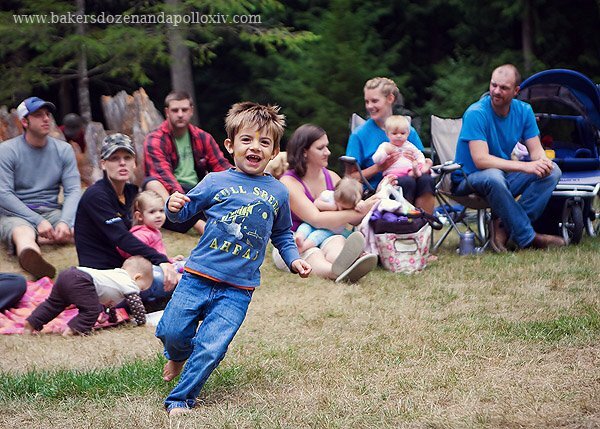 This weekend was the first annual church campout with Grace Church Bellingham. I won’t lie, it was a bit of a rough weekend at times. One child refused to use the campground bathroom to relieve his or herself of a heavy load all weekend…and ended up moaning and groaning in pain, doubled over, expecting sympathy from me. 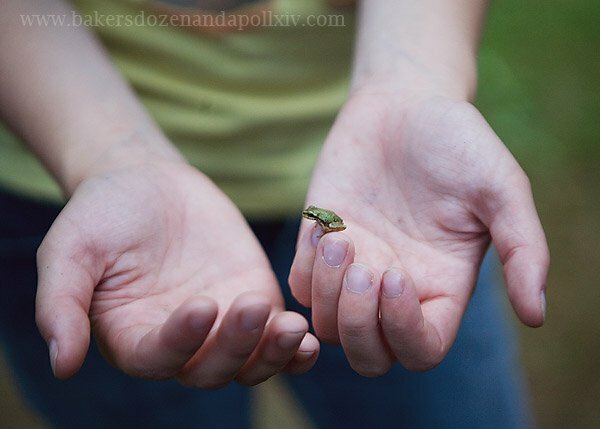 But there were also adorable teeny-tiny tree frogs. 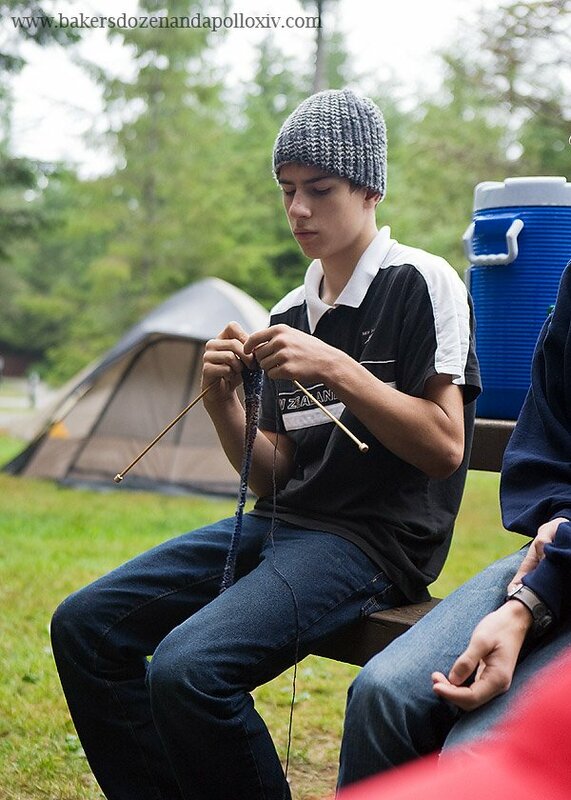 And a handsome teen boy who enjoyed knitting by the campfire in the mornings. And another who played This Is My Father’s World on his harmonica for us. And a curly-haired boy who sipped hot chocolate for the first time ever. 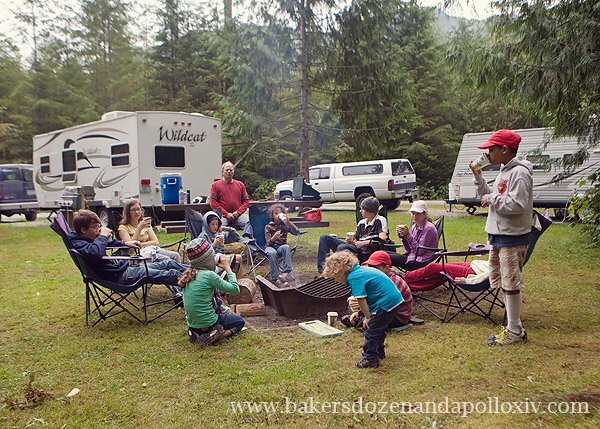 And some pretty sweet times as a family around the campfire. 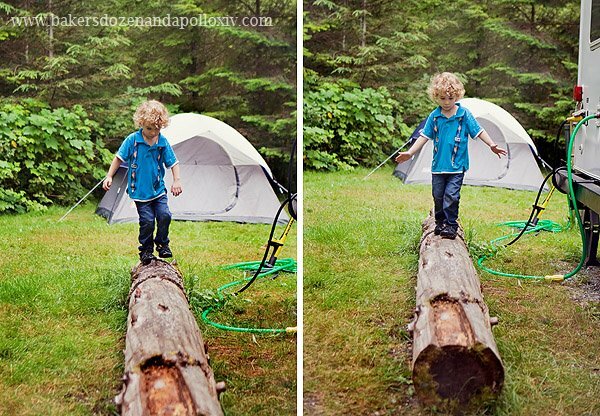 Apollo worked hard on mastering the art of log-walking. And JUMPING! 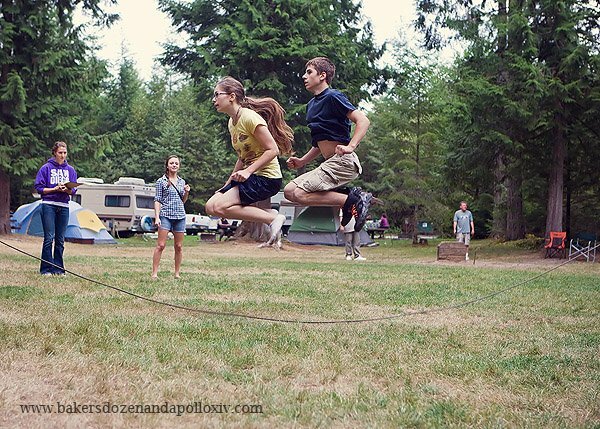 And who could forget the real highlight of the trip: The Kids’ Olympics! Sweet Calvin was more than ready to join in. I photographed Calvin’s birth almost three years ago…and his hair looks almost the same in this picture as it did then! Tilly and Enoch were the two finalists and in the end Enoch won, gaining points for his team. Send me an email, Rachel, and I’ll get you in touch with your prize! Thank you, Sarah. I honestly debated whether or not to include the Mystery Poop story. Glad it made you laugh. I just wanted to comment on this and say how much you inspire me in my parenting when I read your blog. 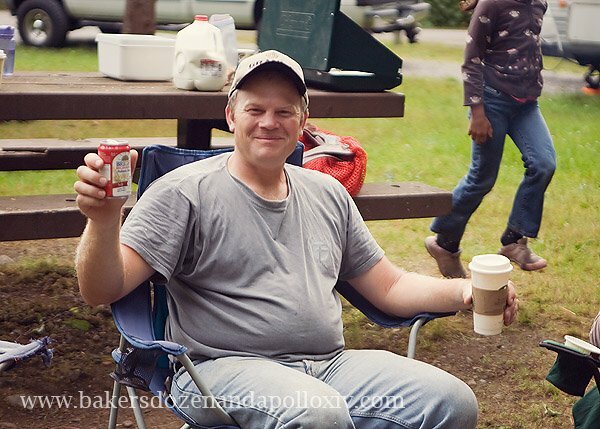 I love that you explain how tough parts of your camping trip was but then focus entirely on the positive. 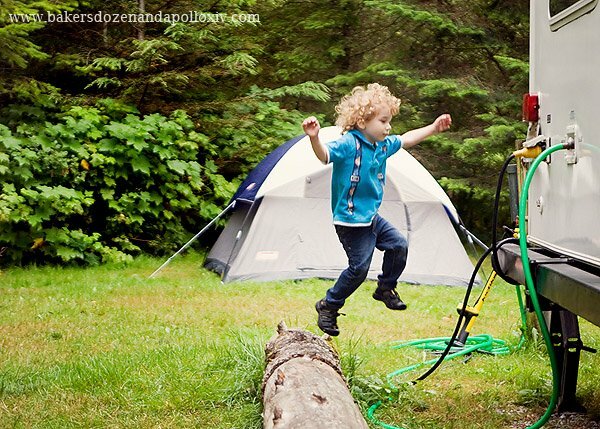 I just returned from my first camping trip with my nearly 3 year old & 1 year old and it was such hard work but filled with amazing moments. I’ve been trying to focus on remembering those amazing moments & learning from the hard work & your blog constantly inspires me to ‘try again better tomorrow’ Often I think “I just have 2, Bakers Dozen Renee has 14!”& I’m in awe but thank you for your lovely blog, your daily parenting inspiration & the help you’ve given me just lurking and reading over the past few years. Thank you, Verity. That is very encouraging! Looking at the picture of Apollo today, I had a thought I haven’t had in ages.. but he looks taller to me. He looks like he’s grown. Maybe it’s angles or clothing, but its a nice change because the poor guy struggles so hard for every cm. Mystery poop has happened to all of us. I hate the mystery poop smell in the house. We have a training toddler who goes mostly pantsless, a dog who had a bad reaction to medication, and open windows.. wafting poop smell terrifies me because there’s so many place it could come from! He has gained a pound since we added a third can of formula to his daily diet. I have had to loosen the adjustable elastic on his pants! Enoch looks incredibly focused and can also jump incredibly high!